Modern, utilitarian or somewhere in between. Contemporary design style is all about open spaces and clean lines. Large-scale, bold embellishments, natural tones, and minimalistic design create a modern look of elegance. 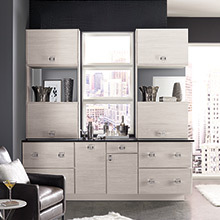 Contemporary cabinets rely on sleek, smooth and polished surfaces - think streamlined, cultured and bold.